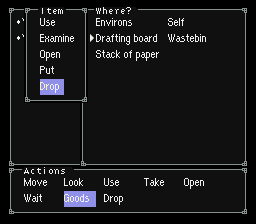 A little while back I posted news about an EarthBound text adventure hack called “Hack”. Today’s hack is also a text adventure hack, but is completely different. It’s a small tech demo created by Mr. Accident called ZorkBound. He and Rufus have been making some incredible EarthBound hacking tools these past few months, and this latest hack is a test of a bunch of early stuff he’s working on. For more details, check this forum post out. What’s especially neat about this game is that you can pick up objects, move them around, and interact with them with other items. I think Mr. Accident is probably working on a program to make it easy for regular people to make these text adventure hacks, if so that’d be pretty cool. EarthBound hacking is insane, so helping regular people make cool hacks gets a thumbs-up from me. If you want to try out the hack yourself, here is the patch and the Easy EarthBound Patcher. Also, Mr. Accident says don’t use save states or else evil things will happen, so beware. Well, I love me some text-based adventures, this looks really good, possibly even better than radical Dreamers. but no save states? 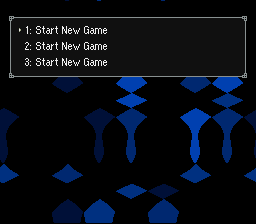 then how do you save in a text game? This hack looks great. But no saves? Mr. Accident explains that it’s a short enough demo that you shouldn’t need to save. I assume that at some point save states will be supported again and/or normal saves should work. I wonder why it is that save states don’t work. Save states are handled by the emulator, not the game. It’s hard to imagine what might have been changed by this hack that would prevent the emulator from “remembering” the state just as it does for any other game. Save states don’t work because EB++ (which is used to make this hack) messes with memory to add more flags, Control Codes, etc. No EB++ game will be compatible with Save States. LOL at save states not working. It’s too bad about the save states, but that’s not going to stop me from trying it. Can people not get through games anymore without savestating? I patch it with lunar ips, it glitches. i patch it with the EB patcher, it still doesnt work! Yeah, the save state thing is because Rufus’s EB++ expands the SRAM space available and uses some of that as temporary memory. SRAM is not restored on loading a savestate in an emulator, though, so you get a situation where a lot of the data used by the game is hopelessly out of sync, and the next thing it does is crash horribly. I’m hoping we’ll be able to find some unused space in main memory to store EB++ data, so that way savestates will work normally again. There’s a very sizable chunk (almost 8KB) starting around $7F:6000 that doesn’t seem to be used for much of anything, so that’s one promising direction of inquiry. Anyway, as regards patching: I’ve noticed that if you patch a 3MB ROM using Lunar IPS, Snes9x will refuse to load it. This is because Lunar IPS only expands the file as far as it needs to to write all of the differences, and in this case that’s 3 bytes short of a full 32 megabits. For some bizarre reason, Snes9x will not load any ROM file that has a filesize that is not a multiple of 64K. It’s really stupid, IMHO; ZSNES will load slightly off-size ROMs just fine. So, definitely use the EB Easy Patcher if you’re going to play the game using Snes9x. If you’re using ZSNES, it doesn’t matter. Mr. Accident: One thing byuu (bsnes guy) is working on is something that well help hackers detect unused areas of memory that they can use. I don’t know if he’s implemented it yet, it’s possible that he has already, but he mentioned it here several months ago. I know he’s been working on his debugger for a while now at least. I dont mean to seem rude but, who honestly likes these text adventure games? And why would you want an EB related one? One of the coolest things about EB is the colors and characters so why would you bother playing a black and white text box? Mato: Yeah, I’m definitely looking forward to byuu’s debugger. Geiger’s Snes9x debugger is useful, but so frustratingly limited sometimes. ScottKO: Who likes text adventure games? Smart, attractive, successful people, of course! Seriously, maybe you don’t like text adventures all that much, but lots of people do; and the neat thing about one based on the EB engine is that you get immediate access to all the music, sound effects, and so on that are used in the game. You could also include monster fights using the normal battle system, or use the map engine to display pictures of things, and so on. So you certainly could include EarthBoundy colors and images while still making a primarily text-based game. If it weren’t for text adventure games (the core of the classic RPG), Earthbound would have never been made. It’s kind of like reading a book instead of watching a movie based on the book. A lot of people prefer the book because there are much less limits to your imagination. A lot of people prefer the movie because they have little to no imagination or simply don’t like to read. ATTENTION INTERNET: They weren’t joking when they said not to break the mirror. Ok, I played this, and I’m stumped. Where is that freaking key to the suitcase?! And I also can’t find the Omega stone. Help! If I remember correctly the Omega stone is in the wastebin in the drawing room. For the key, ‘Use’ the window in the bedroom to close the curtains, shoot the mirror, ‘Look’ at the paper that falls down and then open the red book to the page it tells you to. I wan to know how to get the stone on top of the bed though, I can’t seem to move any chairs to reach it. 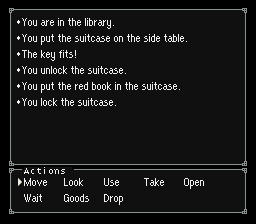 Don’t listen to what I said above, that’s for the Gamma stone, to get the Omega, ‘look’ at the bookcase in the library to find ‘Clean Bookcase’, then ‘Use’ it to find the alcove with the suitcase that has the Omega stone. I knew the Gamma Stone was in the wastebin of the drawing room, I just didn’t know where the Omega Stone was, or where the jey to the suitcase was. Thanks W.M.! 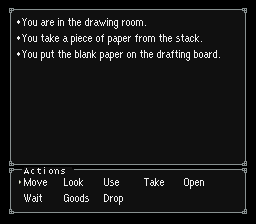 Oh, and by the way, to get the Beta Stone (the stone on top of the bed), get the Pencil off the table in the Central Room, go the Drawing Room, take a piece of blank paper, put it onto the drawing board, and draw an “Eldlich Horror”, or whatever it’s called. Then, take it off the floor (its noted as “Dread symbol”), and take it to the bedroom. Use it, and the Beta Stone will burn through the canopy and land on the bed. Is Mr. A going to make something for other PK Hackers like us to easily make text adventure hacks like this? I’m wondering because I want to create a text adventure hack like this, but I don’t know how. His CCScript tool makes it easy to make stuff like this. I know about CCScript, but I’m not sure what kind of commands to put in to make a text adventure hack like ZB. umm I have a websOS palm pixi and I’m trying to look for an unpachable one so if you make a download link I’ll reward you wonerfully.